I started a project I have been thinking about doing for a while. When working on my last book project, I discovered the versatility of the hexagon shape. I know - I know - late to the party considering all the people who have made Grandmother's Flower Garden Quilts over the years - including my Gram Frieda. (I have yet to do any English Paper Piecing.) In my new book, I used the hexagon motif in several of the designs (more on that soon). Several years ago, I saw the movie Nanny McPhee written and directed by Emma Thomspson. Every holiday season, I re-watch it. 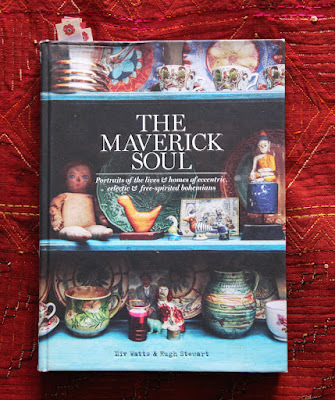 It is a sweet story but the real joy in it for me is all the fantastic color, set design, interior scenes and the fabrics and clothing - so many of them handmade. Here are a couple blurry photos I took as the movie was playing. I fell in love with the afghan. Every time I watch the movie I notice something else about the colors, the art and the fabrics and costumes. Back to the new project. 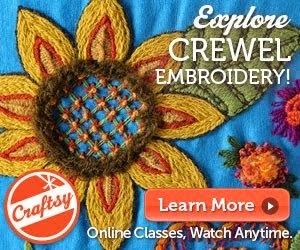 I looked through books and the web to find a hexagon stitch pattern I liked. There sure are a lot of them out there. 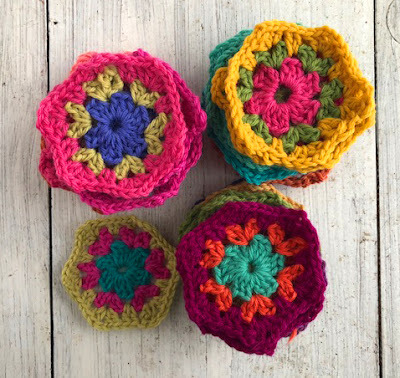 I wanted one that looked like a granny square but with six sides. I wanted it to be easy to remember so I can knock these things out over and over without thinking. These are finished including weaving in the ends - 31 so far. I think I need hundreds. These need their ends woven in. I'm still deciding if I want to add an extra round of crochet to the hexagons so they are a little bigger. I may do. I plan to sew them together by hand. I love to sew by hand so it won't be a chore for me. When I made my last Granny Square afghan awhile back I edged all the squares in a chocolate brown. I am contemplating having the same color go around each edge. Still deciding if I want it to have a cohesive design or an allover crazy colorful look. I'm leaning towards the crazy color. This project will probably take me a couple years but at least I started. I sure do have enough odds and ends of my Color By Kristin and Julia yarns to make several afghans. 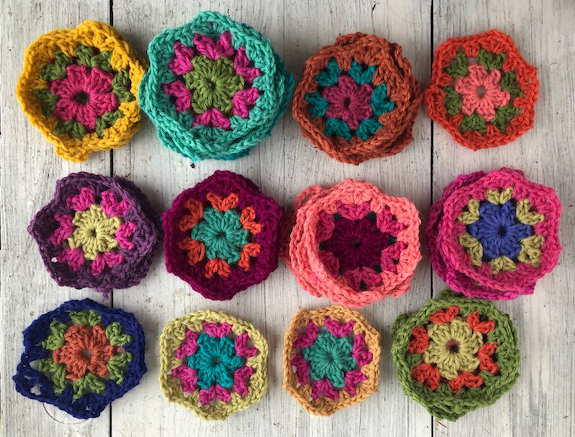 Have you made a crochet granny square afghan yet? Are you totally addicted? I found this one by blogger Erika Eckles. I think the colors are stunning. Read about her project and check out her tutorial for half hexies for the edges here. Gorgeous hexagons! 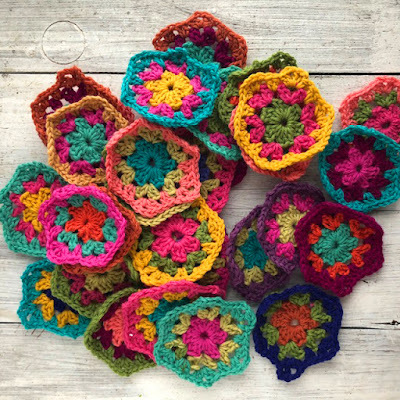 I have not made a granny square blanket, but will one day. 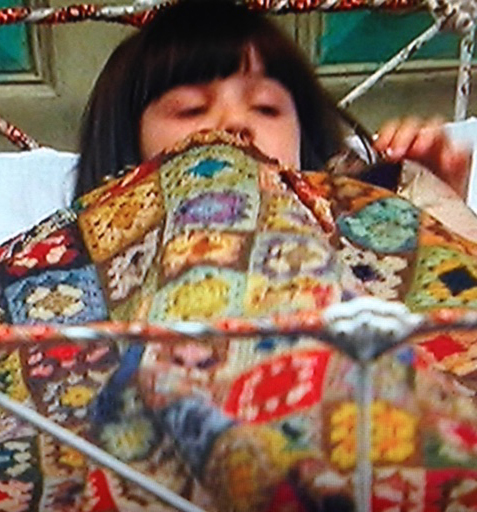 I started a mitered square blanket several years ago, like the one in Mason-Dixon knitting, striped knitted squares. I’ve made around 45 of the needed eighty. I must finish that first. But, I see one like yours in my future.. I have made the squares for a granny square blanket with the colors of your wonderful yarn! I’ve had the squares done for a bit. This project is on hiatus. There are still a lot of ends to work in, plus I have to sew the whole thing together. Some day! I’m glad you mentioned your book. I can’t wait for it to come out! That is beautiful !!! I’m afraid I have a small granny square started and will do well to finish it let alone such a beauty. I do so admire them though. I’m just better with needle and thread than with hook and yarn. Aren’t you in lambing season? 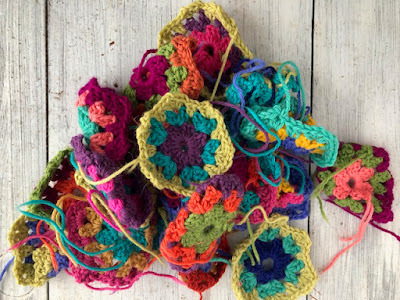 You know, there's a reason why after 40 years I have STAR WARS model kits *still* IN the cellophane... After I did my first Granny Square afghan when I was about 10 or 11, I quickly discovered a profound dislike for "ASSEMBLY-IS-REQUIRED"! And, in turn, began making blankets using an "add-on" to ONE piece methodology... Granted, there still are Tailends, but I've managed to simplify that as well! First off, tie a single knot on your yarn end just over a half inch in. This prevent fraying. When you begin to crochet, you need only leave a 2-inch tailend. The same goes for when you end a colour row. Leave just over 2-inches, cut, put in the knot. Then double-knot those 2 tailends together. Now, when doing the actual "weaving", lose the "needle". Take another crochet hook that's at least 2mm or 2 full sizes smaller than what you're working with. 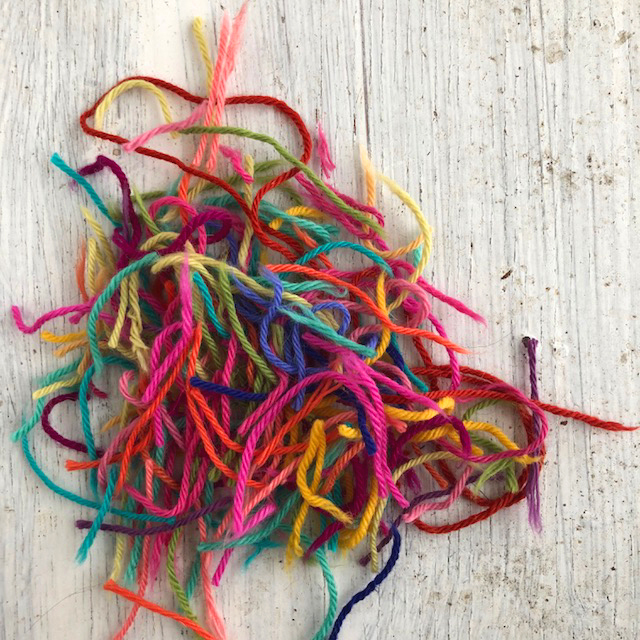 Run it through the spots that you want to run the one tailend-strand through, hook the yarn above the knot and pull through! You'll have to go in through a few stitches at a time. [Run the other one in the opposite direction.] Done correctly, the knot will secure the tail within the stitches when the square/hex is stretched out. In the end, you SAVE on yarn, don't have to go blind threading any needles, and/or getting pricked by them! Anyhoo, hope this method helps. WHATEVER. *LOVE* the COLOURS! The finished product will without doubt be AWESOME! Can't wait! I too love Nanny McPhee for the very same reasons! 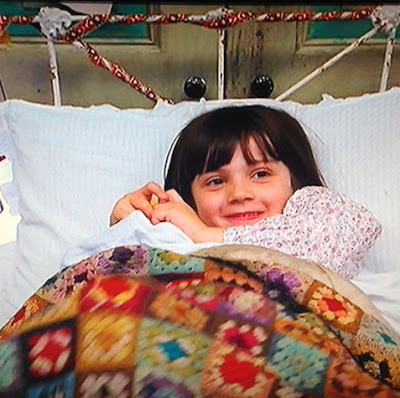 Have you seen Nanny McPhee and the Big Bang? Fast forward to the 2nd WW - more subdued, but still beautiful colours. You can work in the ends as you go in both crochet and knitting. It saves a lot of time. This is a beautiful blanket - I've added it to my future makes list. Thanks for sharing. I love Granny McPhee for the same reason - all the beautiful handmades. Have you watched "Ballet Shoes" - it has wonderful 40's sweaters.